Was Mithras born of a virgin, in a stable, on Dec. 25? Question: I read in the letters-to-the-editor section of [a major U.S. newspaper] that: "pre-Jesus Roman soldiers worshiped Mithras, who was born in a stable to a virgin on Dec. 25." And that "Isis, the great Egyptian Goddess, had absorbed Hellenistic qualities by the time of Roman rule, and was the most popular divinity in the Mediterranean basin. In her temples, Isis was often depicted with her son, Horus, on her lap. (Horus was conceived with a revivified god.) As Christianity 'encroached,' statues of Isis with Horus were repainted and renamed, Mary and Jesus. Numerous myths recount a sacrificed or slain god who is resurrected through the efforts of a goddess; Isis/Osiris and Inanna/Dummuz (Sumerian) are two well-known. Historians agree that to make Christianity more palatable to the masses, the church absorbed ancient traditions and gods. Pagan traditions are as valid as other spiritual paths, and instead of insisting that their path is the only one, isn't it about time that Christians develop respect for what others believe?" Is this true? Response: The letter writer is using a lot of false information, especially in claiming that the mythical birth of Mithras was similar to the birth of Jesus. They were not similar, in any detail, as will be explained later. Many Roman soldiers did worship a mythical god named Mithras, but there is no record of any ancient tradition involving a December 25th birth date for Mithras. See, for example: de-coding Da Vinci: The facts behind the fiction of The Da Vinci Code, by Amy Welborn. In fact, there are few, if any, written records from Mithraic worshippers explaining their beliefs. Much of the information that we have about Mithraism comes from scholars who offer speculative interpretations of Mithraic artwork, which began to appear a few centuries after the time of Jesus. So whatever similarities there might be between Christianity and Mithraism, it would be easier to speculate that Mithraism borrowed from Christianity, not the other way around. As for the claim that myth of Mithras involves him being born in a stable or manger, like Jesus, this is false. 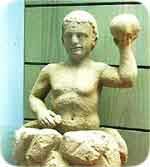 The story of Mithras involves him being hatched from an egg of rock, before time itself began. See, for example, The Mysteries of Mithras, by Franz Cumont. For the record, Cumont was a non-Christian scholar who was antagonistic towards Christianity. As for the "virgin birth" of Mithras, even if one decides to claim that the rock from which Mithras was hatched was a virgin, or that the being or entity that laid the egg of rock was a virgin, any comparisons between this birth scenario and the virgin birth of Jesus, through a human and mortal mother, would be absurd and undignified. As for the claim that there were paintings of the mythical Isis holding her mythical son Horus, so what? If the letter writer is trying to make the point that the artists who painted Christian themes were influenced by artists who painted non-Christian themes, then it should be pointed out that Christianity is not based on paintings. Christianity can influence a painting, but a painting cannot influence Christianity. And, if the letter writer is trying to claim that the idea, motif, or concept of a mother holding an infant son is not unique to Christianity, then it should be pointed out that no one has ever said otherwise. The fact is, mothers have been holding their infants since human history began. And about 50 percent of these infants have been male. No one should be surprised that there are Christian and non-Christian depictions of mothers holding children. As for the claim that "Numerous myths recount a sacrificed or slain god who is resurrected," I challenge the letter writer, and anyone else, to provide a single example of this that can be found in any type of literature or artwork that pre-dates the time of Christianity. (In all the research that I have done, I have found no examples of this). As for the claim that "Historians agree that to make Christianity more palatable to the masses, the church absorbed ancient traditions and gods," the first response is to note that Christianity is monotheistic religion that does not believe in "gods." The second response is to question what historians supposedly agree upon. The fact is, the historians from the first, second and third centuries, including Tacitus, Suetonius, and a number of early Christian writers, made it clear that Christianity was spreading very rapidly, despite the fact that many pagans harshly persecuted Christians during this time. Because of the rapid growth in the popularity of Christianity, many pagan and gnostic religions were under tremendous pressure to adopt and adapt elements of Christianity, in an attempt to become more appealing to people who were abandoning paganism and gnosticism. The plan failed. Historians agree that pagan and gnostic religions were highly prone to syncretism - borrowing and incorporating ideas from other religions. The preponderance of evidence plainly and loudly suggests that pagan and gnostic religions borrowed from Christianity, not the other way around. 1. Grab a pen and a piece of paper. 2. Write down a list of all the countries in the world that have laws allowing people from different religious backgrounds to become immigrants, and that have laws protecting the freedom of religion, not to mention the freedom to criticize the religion of the majority of people within those countries. Next: Does the Bible teach that the earth is flat?